Konzeptentwurf für Urban Space by Design. Räumliche Interventionen, King’s Cross Station (Bahnhof), London, UK. Wettbewerbs- und Ausstellungsbeitrag, zu Urban Space by Design, am Royal Institute for British Architects, London, UK. 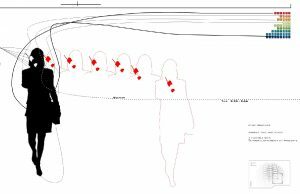 The interests of this particular project are in exploring the existing urban space of King’s Cross Station as a potential mediation or dynamic interface, adequately infiltrating a prefixed pattern of consumer behaviorism. The study starts with an observation of temporary territories as inspired by the continuously shifting spheres of movements within the Station. Detecting existing sequences of motion enables to outline moments of pause and acceleration. Conversation Pieces: Shadowing proposes to use technology to capture the movements of passersby to then project movement back as shadows while the people are passing by. The project is designed to explore the disconnectedness that technology can create and the issues of surveillance culture that penetrates urban spaces. Disruption, displacement and the desire to create feelings of discomfort are the underlying concept for this project. – The aim, nevertheless, is to to emphasize and re-activate the interface of urban space and use. Video Screening within existing Advertisement Frames. The images projected on the screens would be real time recordings of people passing by. 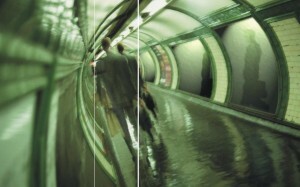 While walking through the Tube-Tunnel you are passing a series of advert-frames to your left and right. Following the familiar rhythm of static strives, the motion shadow of an extraneous person suddenly accompanies your steps within some advert frames, to then, as sudden, disappear again – leaving you alone within the crowd.